On a rainy, gloomy afternoon in East Rutherford, the 8-3 Chicago Bears, winners of 5 straight, took on the 3-8 Giants. The Bears were without their starting quarterback, Mitch Trubisky, but were being led by veteran backup Chase Daniel whom led them to a win in Detroit on Thanksgiving 10 days prior. The tale of the first half was very much about a puttering Giants offense being picked up by the defense that has shown glimpses throughout the year. Eli Manning got off to a rough start, throwing a couple of near-interceptions on the first two drives. On his eighth attempt of the game, his pass did end up in the hands of a CHI defender. Kyle Fuller picked off his 6th pass of the season and this one had the look of a defensive battle. I say that because Daniel, who started his fourth game in 10 years, gave the Giants 7-0 lead on a pick 6 thrown to Alec Ogletree on their second play from scrimmage. Both teams were forced to fight through poor QB play. All was not lost offensively, however, as both teams were seeing success with their respective ground game. The dual RB system that CHI has is one of the best in the league. Jordan Howard and Tarik Cohen combined for 98 yards on 21 carries, further proving the NYG run defense since the trade of DT Damon Harrison has really been a newfound weakness. The Bears used that rushing attack in combination with a sandlot-type passing game to drive the ball 70 yards on 10 plays to net their first score of the game towards the end of the 1st quarter. Daniel hit backup tight end Adam Shaheen on a 2-yard rollout pass to tie it up at 7. More consistent gains via the running game and a 30-yard gain via a pass to Allen Robinson to put them inside the NYG 10 with just a few minutes left in the second quarter. Instead of going for a short field goal on 4th and goal from 1-yard line, Head Coach Matt Nagy put the ball in the hands of defensive tackle Akiem Hicks who crossed the goal line for a touchdown, uncovering memories of William Perry’s role as a short yardage back 25+ years ago. The two struggling offenses exchanged possessions in the final 3 minutes with NYG getting one more shot with about a minute left. Manning was sacked on the first two plays and it appeared they were ready to concede the half but CHI opted to stop the clock with 17 seconds left. This was one of the most overlooked, yet most important moments of the game. CHI simply called a timeout to make NYG punt the ball in rainy weather, which naturally creates more margin for error. In typical NFL fashion, NYG opted to run a draw play on 3rd and 23. This is where Barkley once again proves his worth. In his typical highlight-reel fashion, he created something out of nothing, broke 2 tackles, missed a couple more, and gained 22 yards on a play where he had no business gaining anything more than a third of that. With just a few seconds left, NYG opted to go for it on 4th and 1 which they converted. That left 1 second on the clock and allowed Aldrick Rosas to come out for a 57 yard attempt. The potential Pro-Bowler nailed it as time expired, setting a new franchise record and giving NYG momentum heading into the locker room. That momentum was taken to a new level on the first drive of the second half, the most important drive of the game according to a lot of coaches. NYG gained 26 yards on the first 3 plays and opted for a trick play on the 4th. A reverse to Odell Beckham that was designed to be a pass resulted in him tossing a flat-footed ball 50 yards in the air into the waiting arms of Russell Shepard, who was completely alone in front of the end zone. An easy score for the home team put them up 17-14 and NYG had this game by the horns. After forcing another 3 and out as CHI continued to struggle on 3rd down, NYG used a more traditional approach to net 7 more points on their next possession. A 13-play drive that gave the ball to Barkley seven times ended in a 4th and goal touchdown pass from Manning to Beckham. The Giants had a game-high 10 point lead and they maintained that lead for the first 5 minutes of the 4th quarter. CHI got within 7 with just under 10 minutes left via a 36-yard field goal. NYG was in a similar position as they were last week. They had a second half lead and a running back that was built for situations like this: to bleed the clock to death. However on the third play of the drive, Barkley went down hard on the football and was in obvious pain. I cannot remember a time where the entire stadium let out a collective, fearful gasp like that. It goes to show just how vital this kid is to not only the offense, but the entire organization. He walked off the field and missed the rest of that drive. NYG pressed forward, however. They converted two straight 3rd downs but faulted on the next one, as the offensive line started to falter. Manning was sacked for a 9-yard loss from the CHI 30, putting them just out of field goal range and forcing them to give the ball back to the Daniel-led offense. The defense had to step up and make a stop. And make a stop they did. BW Webb forced a fumble after the catch by Taylor Gabriel that was recovered by Sean Chandler. NYG had a 7 point lead with the ball in their possession with just over 2 minutes left. A holding penalty by fullback Elijah Penny pushed them back 10 yards and made a game-sealing first down unrealistic, but NYG did get past the 2 minute warning and put another 3 points on the board via a Rosas field goal. It was 27-17 with 1:49 left when CHI took back the ball. The Bears used some chunk-gains via passes to Robinson and Cohen in addition to a roughing-the-passer penalty by Chandler to get all the way inside the NYG 5-yard line. Chicago opted for the 3 points so that they could take a shot in the dark on an onsides kick, as it was a 2-possession game. That shot in the dark worked out well, as they recovered. The Bears then used every bit of game clock to march down the field. And with 3 seconds left, they ran a reverse to Cohen who threw the ball into the end zone to Anthony Miller for the game-tying score. This one was headed to overtime. NYG won the toss and took the ball first. They wasted no time giving the ball to their best player. Barkley gained 29 yards on the first play and with a couple completions to Sterling Shepard, who was also playing through pain, NYG took the lead back 30-27. CHI had one more shot. They made it just shy of midfield but a slippery ball and a productive pass rush put an end to the sloppy-CHI offensive surge. The defense came up with the stop that they needed the most. -Eli Manning: 19/35 – 170 yards – 1 TD / 1 INT. Now that the offensive line has at last somewhat stabilized, we are starting to get a stronger grasp on what Eli Manning is at this point in his career. In this one, on a somewhat slipper/rainy day, Manning was off. He was horrid in the first half, going 7-17 and an interception in addition to 2-3 more near INTs. He really didn’t connect on difficult passes, although he threw a beautiful ball that should have sealed the win to Sterling Shepard in overtime, but Shepard dropped it. Manning can be trusted when the game is on the line, but his lack of movement away from pressure both in and out of the pocket really limits this offense. -Saquon Barkley: 24 att / 125 yards – 3 rec / 21 yards. Chalk up another 100+ total yard performance for the rookie, his 10th of the season. The Giants are now 3-0 when Barkley 20+ carries and as I said last week, that will be as important as a barometer for his team to hit as any in the coming years. His presence in the backfield changes how the defense lines up, plain and simple. There aren’t many backs in the NFL that have that kind of impact. Barkley’s 22-yard run before halftime and 29-yard run to begin overtime were the two biggest offensive plays of the day for NYG. Keep giving this kid the ball guys, it is turning into a no brainer. -Odell Beckham: 3 rec / 35 yards – 1 pass att / 49 yards – 1 TD. Beckham’s biggest play of the day came on his second pass of the season. 2 passes, 2 touchdowns for OBJ. Beckham also had a few key blocks on the outside and it refreshing to see his effort out there. The onsides kick where he made a business decision to not pursue the ball because of the likelihood he would have been trucked did rightfully bother some. If this were a playoff spot on the line and that happened, everyone would have a right to be enraged. But I will say this, part of the game is avoiding injury and it isn’t too different than Manning falling to the ground as a pass rusher gets near him. So don’t play the double standard game. One more thing regarding Beckham; I would like to see this scheme find more ways to get him the ball. 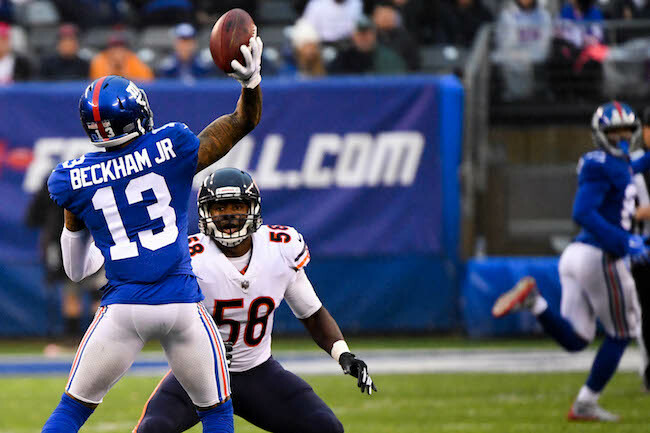 I see so many offenses have no issues getting the ball to their top receivers and it just seems like it is too much of a struggle with Beckham. They need to figure that out. -Sterling Shepard: 4 rec / 28 yards. Shepard was hurt early, it looked like some sort of abdominal or ribcage strain. He played through the pain but didn’t impact the game from a volume perspective, but did come up with 2 key catches in overtime. He did miss his opportunity at a game winning, overtime catch in the end zone as he just didn’t track the ball while moving vertically, something I have noticed about him a few times. -Backups Russell Shepard and Bennie Fowler combined for 3 catches / 70 yards. Both had big plays in different fashions. Shepard came up with the 49-yard Beckham TD pass, thus it got more publicity. However, Fowler’s 3rd and 11 catch and tough-earned yards after that netted a first down in the 4th quarter allowed the clock to keep running for what turned out to be another 4+ minutes, which was huge. -Rhett Ellison: 4 rec / 42 yards. Ellison was the team’s leading receiver ironically. Since he has stepped in for Evan Engram as the starting tight end, this team’s running game has been more productive and the position’s production in the passing game hasn’t skipped a beat. -Scott Simonson: 2 rec / 25 yards. While he did come up with a couple key blocks in addition to a tough 3rd down catch that ended up being pretty crucial, he was flagged 3 times on the day. Way too much for anyone, let alone a guy that played under 40% of the snaps. -With the amount that Bears DE Khalil Mack is moved around, both Nate Solder and Chad Wheeler had a tall task placed on their shoulders. Solder responded well finishing with 1 TFL but no sacks or pressures allowed. While he does make Manning rush a bit as he gets walked into the pocket, his overall play has leveled off a bit. Wheeler, on the other hand, had one of his worst games of the season. He allowed 2 sacks, 2 pressures, and a TFL. He really couldn’t sustain his position against power and his balance was off all afternoon. Not a good combination. -Solid day for the guards. Both Will Hernandez and Jamon Brown finished with positive grades. Hernandez was really productive when he pulled. That is where his power/foot speed combination are at its best. He still has work to do as a pass blocker, as he was flagged for a hold, but he continues to be the most consistent OL on this team. Brown was solid in both departments. He finished with the highest grade among the OL in this one. NYG is 3-1 since he has been added to the team. -Spencer Pulley continues to be the weak point of the middle. He allowed a sack and a TFL, as he was not match for Akiem Hicks, one of the better run defenders in the league. -Very solid, disruptive game from Olivier Vernon. 5 tackles, 2 sacks, 2 pressures, 1 TFL, and 1 forced fumble. That is a stat line that anyone and everyone would gush over if it weren’t Vernon, to be honest. While he remains one of the most up-and-down players on a defense that has been very up-and-down as a whole, his level of play on the outside is on a completely different level than everyone else within the edge group. -Kareem Martin added 5 tackles and a TFL of his own, as he was very solid in the first half. He, along with Kerry Wynn, had a few key spots in big moments on 3rd down. –BJ Hill put in a career game, as I’m not sure he will ever record 3 sacks in a single game again. They were his only 3 tackles of the day, but he displayed top tier technique and punch off the line. He was approaching the “dominant” level in the second half when it came to snap-by-snap impact. -Dalvin Tomlinson was as active as we’ve seen him all year. He finished with 7 tackles and 2 TFL along with a pressure. He really is a better athlete than some give him credit for and knowing how Bettcher built his defensive line in ARI, it makes sense why he has enough confidence in the second-year pro to take over for Damon Harrison at NT. His range within the tackle box is wide and he really brings a physical presence. -Josh Mauro, Mario Edwards, and RJ McIntosh essentially split backup snaps. Edwards continues to be the aggressive, up-field penetrator, but this week it got him into trouble. He was flagged twice, one of which was on a 3rd down stop. Mauro continues to be Mr. Stout inside and McIntosh is still getting his feet wet, showing some good athletic ability. -Alec Ogletree has been getting the rough end of these game reviews for most of the year, but he deserves the game ball in this one. A team-leading 10 tackles in addition to 2 athletic interceptions, one of which was returned for a touchdown in the 1st quarter, were integral to NYG winning this game. He was active in pursuit and stout between the tackles. Excellent game from him, his best as a Giant. -Tae Davis and Ukeme Eligwe split snaps next to Ogletree. Davis has been struggling to play between the tackles, as he is almost-woefully undersized and came from a low level of college football. Eligwe flashed a few times. He is more physical, stouter, and showed plus-burst as a blitzer, recording 3 tackles and a pressure. -Don’t put it in the books yet, but the Janoris Jenkins / BW Webb duo has actually been grading out as one of the top 10 CB duos in the NFL over the past 8 weeks. They have both been flying around all over the field and defending deep routes exceptionally well. Part of what they do well can only be seen on the All-22 tape, but these two are really holding it down in a league where playing corner is almost impossible. Jenkins finished with 3 pass break ups and Webb finished with 1 of his own in addition to a forced fumble that NYG recovered. -Grant Haley was flying all over the field. He finished with 8 tackles and 2 TFL. I’ve said this before but it keeps happening over and over; Haley may be small but this kid is really tough and physical. His quickness and burst are near top-tier but combining his toughness and knack for ball reactions with them makes him a legit candidate to be a very good player for this defense next year. This is a really important stretch for him. –Landon Collins continues to factor vs the run, finishing with 5 tackles and a TFL. He continues to get burned in man coverage. This time it was Tarik Cohen not once, but twice. I don’t want to beat a dead horse here. -Curtis Riley and Michael Thomas are solid role players who get exposed with the more snaps they get. Riley dropped an interception that was essentially thrown right to him. I guess that why he is plays on defense. Thomas got flagged for holding as CHI was making their 4th quarter comeback but he did play Cohen in coverage well a few times. -Rookie Sean Chandler saw a season high 21 snaps. This coaching staff really likes him and I think with the instability that Riley plays with, we may see more. He recovered the fumble forced by Webb in the 4th quarter but was flagged for a low hit on QB Daniels during the 4th quarter comeback by CHI. They eased Haley into the rotation and now I think Chandler is next. -K Aldrick Rosas: 3/3 (Made 57-37-44). Rosas is on fire and he was a vital piece to this win. His 57 yarder is a franchise record and his 44 yarder in overtime is as pressure-heavy as it gets. He deserves strong Pro Bowl consideration. -P Riley Dixon: 7 punts – 44.3 avg – 42.1 net. Dixon was on the field often in this one, a season high 7 punts. That 42.1 net is very solid and he put one inside the 5-yard line. -Jawill Davis averaged 12 yards per punt return, a very good number and Corey Coleman’s cooled off a bit after a few strong weeks as the team’s KR. –This is a hard team to gauge. They’ve had a few convincing wins and lost 4 games by a combined 14 points (7 of which came against the Patriots). I think their defense is as balanced as any team in the league and happens to host arguably the most dominant edge talent out there. Once Mitch Trubisky comes back, their QB position is stabilized and I think this team is one of 3 contenders for the NFC, the other to being LAR and NO. -What I don’t like from a consistency standpoint is their OL play. These guys were really beat badly by an average to below average NYG defensive line. If they run into a team that can really get after the passer, that could end up being their undoing. -Tarik Cohen is one of the most exciting players in the NFL and I think we are only seeing a glimpse of what he will be. He is the only player that I legitimately compared to Darren Sproles when he was coming out of college. Sproles has had a fantastic career, especially when he has played for offensive minds that know how to use him. CHI seems to have figured it out and he could be a guy that ends up having a better career than Sproles in today’s NFL. -This was an interesting game that I think can be looked back on if this core group/coaching staff ever turn it around. The offense struggled in the first half but they were picked up by the defense. Then, in the second half, the defense struggled but they were picked up by the offense. It is amazing how many roller coasters a team can go through in a single game but the ones that stay even keel and take advantage of the opportunities given to them are the winners. This is part of developing a winning culture that I think is so vital to year after year success which is why we should all want this team to win every week. -The biggest difference this offense will see in the post-Manning era, whenever that is, will be a QB creating on his own under duress. That has never been a strong suit of Eli’s game, but it’s near non-existent at the moment. This offense has a ton more potential with a guy who can move around and is considered a plus-athlete. The options with this personnel are limitless, especially if the OL can be shored up. -As I get deeper into the scouting process for the 2019 Draft and as I watch more of NYG, the right tackle position may need to be a focal point. Wheeler shows admirable effort and hustle. He has come a long way since being an UDFA, no question. But if this OL needs to be a top 10 unit, maybe even a top 5 unit, Wheeler won’t be a part of it. He just can’t do it week to week. I think his role here is important, however. He can be the backup swing tackle who will be relied on in spurts. But I just don’t think he is going to get over the hump as a weekly starter.